A few months ago there was discussion about the front seats in the R207 with regards to the handle on the side to lock the seat not being accessible. Has anyone actually done anything with theirs yet? Here's my idea. I am in the process of gathering parts to switch mine from side to side to have the handle out in the open. 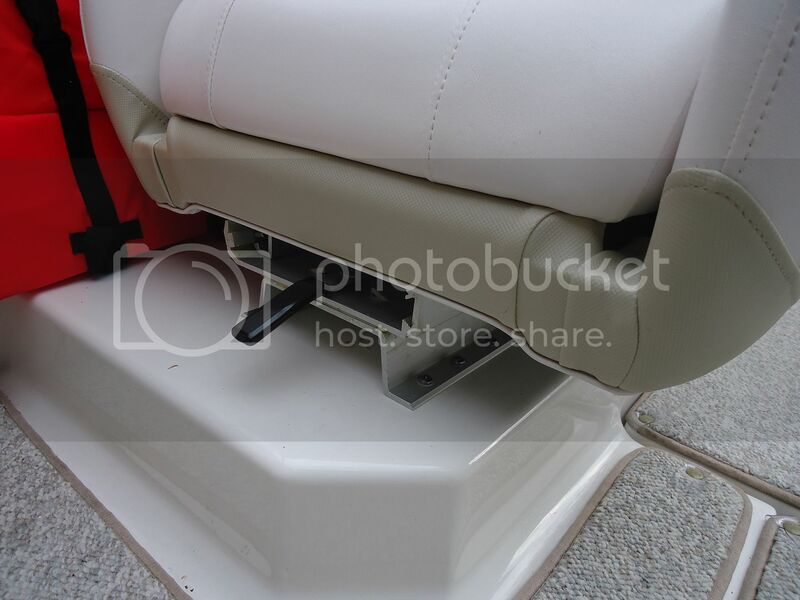 My plan is to put pieces of 1" X 1-1/2" hollow aluminum extrusion under the existing mounting bases to raise the seats 1 1-2" and then through bolt them. I looked in the cooler box (with a mirror) under the seats and there is access to get to the ends of the bolts to install a large washer and lock nut. I may even use a 1/8" thick aluminum plate rather than washers. I have the extrusion and will do all this in a few weeks after I have finished using the boat for the season. 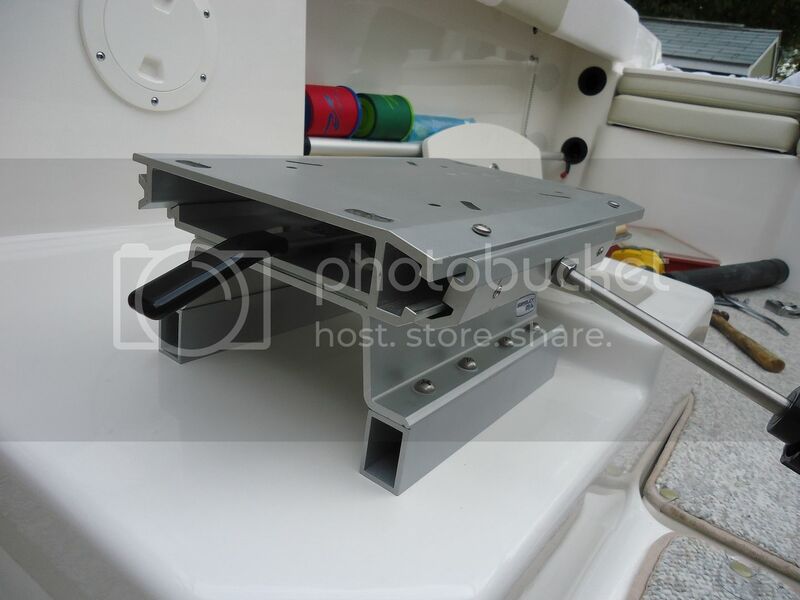 Another change I am making is to add Perko plastic clips on the side wall of the ski locker under the floor to store my stern navigation light pole. Right now it is taking a rod holder spot. I think this is something Robalo should have done. My Whaler I just sold had this. I read the post about the seat adjustments being hard to access and mine are in the same place but I don't have any issue with them. Mine seem to tighten down just fine and stay where I set them with no mods. No bruised knuckles or anything. As far as the nav light goes, my dealer installed the clips (as a courtesy at purchase) in the same spot you're talking about and it works out great. The light doesn't interfere with the storage at all. Went out again today down by Rock Hall. Stripers are still pounding every lure we put in the water. A few less-than-legal but some nice ones well over the legal size mixed in. It was so hot last weekend we got more time on the wakeboard too. Hope everybody's enjoying their Robalos as much as I am. Wally, can you post up a few pictures of the raised seats. I just had my boat shrink wrapped so when I do it it will be next spring. 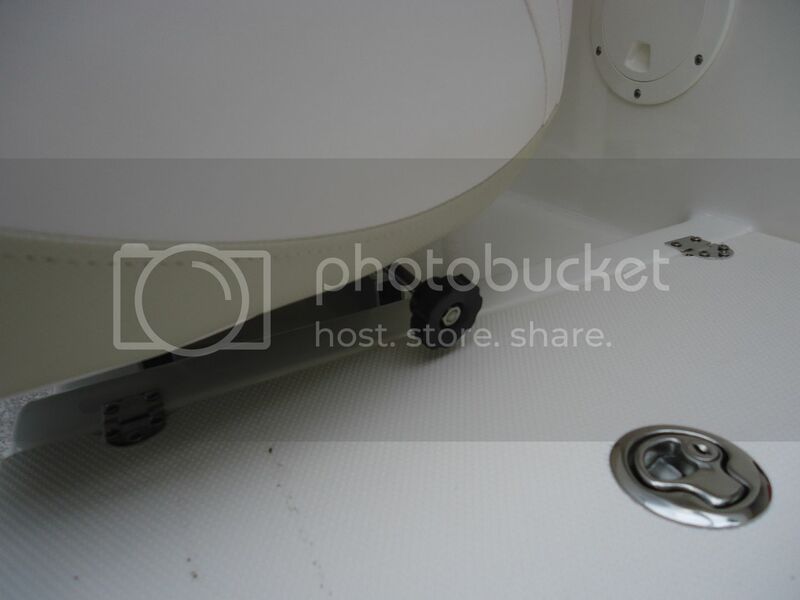 It has taken me a long time but I finally figured out how to post pictures from Photobucket. On my computer I hit CTRL "V", not "K" to insert the image. Anyway, I hope these really do come up. Thanks for the pictures, I will definitely tackle this in the Spring once all the snow melts. 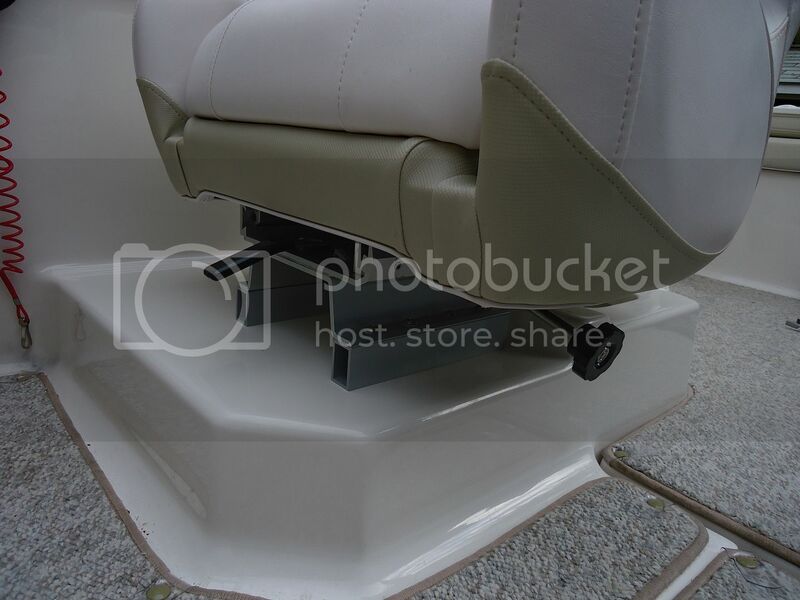 It has been annoying not being able to swivel the seats without removing the knob. What were the dimensions of the aluminum box you used, it looks like 1'' x 1.5'' or so? Yes, the aluminum extrusion is 1/8" wall X 1" X 1-1/2" high. I used the base plate as a template to cut to length and drill the holes. I used 3" long SS bolts, washers, and nylock nuts. Obviously, I thru bolted. There is plenty of room under the seat to get to the nuts. I sanded the underside to try to get a nice smooth surface for the washers and nuts. I have access to a glass bead blaster where I used to work (retired now), so I bead blasted the pieces and then sprayed them with a semi-gloss clear coat to make it look as close to the anodized base plate as possible. I did this at the end of the season so I actually haven't been out on the water with this new height. I'm 6'2" so I always felt I sat a little low. With the thigh rise flip seats, I didn't sit much, so now I can seat even higher!! I forget. Are you the one on the Elk River? Excellent idea. Thanks for the pics and details.